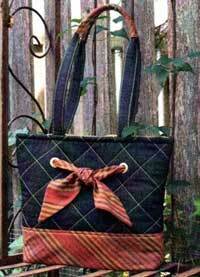 Donni's Bag pattern has instructions for diamond quilting and a convenient zipper. It also has a really cute sassy scarf detail on the front. Finished size is 10 1/2" x 13". We now have grommets available for this pattern!